Ozzy Osbourne was interviewed on the September 24 edition of "Whiplash", the KLOS radio show hosted by Full Metal Jackie. You can now listen to the chat using the widget below. A few excerpts follow. Full Metal Jackie: When it was announced that Zakk Wylde was playing with you again — [it was] such exciting news. He's sort of been your go-to guitarist for much of your career. What makes the two of you work so well together? Ozzy: "Well, I first met Zakk… It's gotta be thirty years [ago], [or] twenty-five. But when Jake E. Lee and I [went our separate ways], I went on a quest to find another guitar player, and I must have had ten thousand resumes and tapes sent in. Believe it or not, the only one I picked up was Zakk Wylde. My wife said to me, 'You've gotta go through these,' and I said, 'I can't go through ten thousand. That would be insane after the first hundred.' So the only one I really looked at was Zakk Wylde, and he had a photo, and I thought, 'Oh, another Randy Rhoads clone.' So when I met him, we just hit it off. It's not like having a bandmember so much as a family member — I mean, we're like family, you know. It was inevitable that Zakk would do his own thing eventually, but we have always remained very close friends — we talk to each other, go out socially from time to time. But I have just done a few gigs over the last couple of months, [and] his playing has improved unbelievably. My jaw dropped at how good he's got. He's really come on since I have been playing with him before. Full Metal Jackie: He's an unbelievable guitar player. It's amazing to watch. Ozzy: "I'm onstage at a show… We did a show when the eclipse happened the other week, on the eclipse, somewhere in America, I don't know where it was. But he was playing, and I thought, 'Is that him?' I mean, his speed is mindblowing; he is so fast with his fingers on the fretboard." Full Metal Jackie: And he's hilarious. Ozzy: "He is a great guy. He's family." Full Metal Jackie: Ozzy, BLACK SABBATH played its final show [in February]. Now that it's sort of sunk in, what will you miss about SABBATH? Ozzy: "Well, you know, it's not that I will miss… I mean I was out of SABBATH thirty-five years, 'cause Ronnie James Dio replaced me in 1979. So the one thing that I'm happy about is that we all became friends again. I mean, it's kind of like a fairytale come true, how I got started off [with] an interest in music when I first heard THE BEATLES and I wanted to be a Beatle, you know. So I went to school with Tony [Iommi], same school as Tony, I was in a band with Geezer [Butler]. It was just one of those things, rags to riches, our lives were forever changed. It was like we ended the SABBATH thing in Birmingham, where we started in England, and it was a very emotional time for me, 'cause we had gone full circle. I believe there is a video of the last show. It would have been nice to end it next year; we would have been around for fifty years. But I'm not retiring. I mean, how can you retire from anything [like that]? It's not a job. You don't have to work with someone that you don't really wanna be around or do any job just for the paycheck. It's fun." Full Metal Jackie: You still enjoy it? Ozzy: "Oh, absolutely! I live for it. I can't imagine [not doing it], you know." Full Metal Jackie: What do you think you would have been doing if you were not Ozzy Osbourne from BLACK SABBATH? Ozzy: "I would probably be either dead or in prison — or both! [Laughs]"
Full Metal Jackie: You touched on THE BEATLES earlier and I know you're a huge BEATLES fan. What did you learn from music by listening to THE BEATLES? Ozzy: "Well, they always had great melodies, you know what I mean? I mean, I appreciate hip-hop — there's no melody — but the lyrics to a lot of the hip-hop songs, I'm going, 'Why can't they put a melody to it?' It's just the thing now with hip-hop. But THE BEATLES always had great melodies. Some of the lyrical content, I go, 'What does that mean?' But the melodies were the thing that got me." Full Metal Jackie: "The Scream" record came out six years ago. What's the plan for another Ozzy album and is Zakk Wylde going to be a part of it? Ozzy: "I've got a bunch of songs written. But you don't sell records anymore. [It's] not cost effective to make a record. I haven't really thought about it, because I've been doing the BLACK SABBATH thing. We did make a BLACK SABBATH record with Rick Rubin, '13', which was our first No. 1, both solo and with BLACK SABBATH, ever in America. When I'd be doing my solo thing, [when we toured with] METALLICA [thirty years ago] and I'd go past their dressing room and they'd be playing BLACK SABBATH. I'd say to my assistant, 'Are they taking the piss? Are they winding him up?' I suddenly started to realize that people were serious about how they were influenced by BLACK SABBATH stuff. 'Cause when you're on the inside looking out, you don't realize this. It kind of took its own spin." Full Metal Jackie: You have to, obviously, at this point, recognize what a footprint BLACK SABBATH has made on everything. Ozzy: "Oh, yeah! The original BLACK SABBATH, with me, Bill [Ward] and Tony and Geezer, we didn't know back in the '70s what we were doing. 'Cause we got ripped off by every manager under the sun we had. But our lives were forever changed." Full Metal Jackie: Did you ever think that this many years later that BLACK SABBATH would be in the history books and that you guys would be touring this many years later? Ozzy: "None of us had any idea. But Tony Iommi is the world's greatest heavy metal writer of the riff. Considering he plays with his fretboard fingertips, which are fake, cause he had them chopped off in a factory, he's a great guitar player." Full Metal Jackie: You have such a remarkable career and live an extraordinary life. What would have surprised you most if someone predicted this life when you were a kid? Ozzy: "I would have never believed it. I remember when BLACK SABBATH's first album got in the charts and I remember thinking, 'I'll be all right for a couple of years.' And here we are forty-nine years later, I'm still doing it. So I just do what I do. I don't know what the answer to the question is. If [someone] would have said [all those years ago], 'This is [what] your life [will be like],' if somebody had predicted it, I would never have believed it. Fifty years next year it will be." Full Metal Jackie: Your music defines hard rock and heavy metal. What are you most proud of about your music? Ozzy: "When you write something, you kind of know when you're on to something good. On certain albums I've done, I [had what I] call filler tracks to finish the album up. And it's the surprises that come. I never intended to play one of these filler tracks live, but many kids will come and go, 'Why don't you play so-and-so and so-and-so?' And I go, 'Why? You like that?' It's kind of like, when a lot of other people like your good idea, it's a bonus, but then you've gotta watch it, 'cause your ego gets in the way. Over the years, I've seen so many big, fantastic bands and artists come up, and I remember going, 'We ain't gonna see the end of this. We're done.' And then they'd fall off and we'd carry on. It's just an amazing career I've had. I can't put it into words. I've always said if my career dwindled to the point where it's five drunks in a bar and I'm playing in there, I'd have pulled the plug a long time ago. But while I'm still doing it, it's great, it's fun. I'm sixty-nine in December. I don't feel sixty-nine, and I don't know how a sixty-nine-year-old guy is supposed to feel. I'm [still] feeling young." Full Metal Jackie: I think it's amazing that you've done it for this long and you still have passion for it and you still love it. Ozzy: "Believe it or not, I still get incredible stage fright. I've only got one voice and if that goes out, I'm done. Okay, some nights I stand there and I go, 'Oh, I'm not so good tonight; I'm not feeling good.' 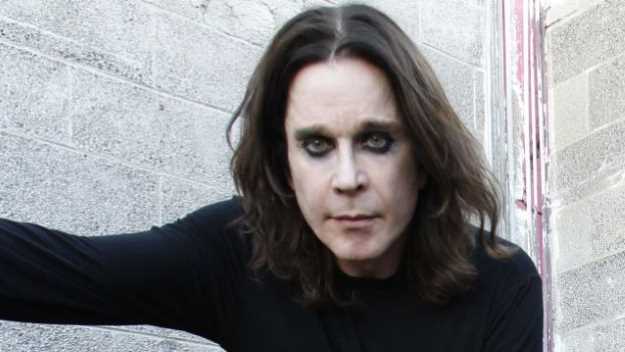 And somebody will come up to me and go, 'Ozzy, you're getting better with age.' And other nights, I go, 'I'm having a great time tonight.' And someone will come up and go, 'You were all right tonight.' So my perspective is sometimes way off track. I just like to give people fun. And whatever it takes without going bizarre and defecating on the stage or whatever — well, I wouldn't do that anyway. But when I do a bad show, I get really upset, because I was once one of them guys that [had] a [regular] job and saved my pennies to see a band. And it's a responsibility I have to give them the best show I can. But I get tired, I get a cold, a flu, but I try my best. I don't go, 'Wow, I've been doing it forty-nine years, fifty years, and I can sing them anything.' I really have a lot of respect for my audience." Full Metal Jackie: As someone who has seen Ozzy and BLACK SABBATH shows forever and never once have I walked away without saying, "Oh my god. That was amazing and it was so much fun." Ozzy: "That's what I try to give. I'm still that guy in the crowd that wants to get turned on. Sometimes it's good, sometimes it's not so good, but I try to give them my honest hard work. Full Metal Jackie: That is evident for anyone who has seen you perform. Looking forward to potentially new music, maybe next year? Ozzy: "I've got about seven songs. One's called 'Mr. Armageddon', one's called 'Crack Cocaine'." Full Metal Jackie: Is there gonna be a proper Ozzy tour next year as well? Ozzy: "Ask the boss, my wife."